Mango Mania is an platform adventure that is about collecting the tasty fruits and solving puzzles. You control an imp that has an insatiable appetite for mangos. In every level you have to pick up three of those fruits and the diamond that opens the gate to the next level. You cannot directly control the direction of the imp's movement. What you can though is make it jump. If you jump against a wall the imp will reverse. On your way you will have to avoid traps and you will have to make clever use of platforms that can be used for a few seconds only before they start to crumble. 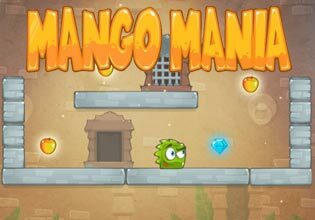 Play Mango Mania now for free and enjoy an epic platform adventure!